The Surface dock since the beginning has shared the same general design principle: a stationary, angled device tailored specifically to each unique Surface model that that clamps around the Surface. While it granted the Surface the ability to behave like a desktop, it took away the use of the kickstand, one of the Surface’s most compelling features. Because each dock was unique to each device, buying a new Surface required re-purchasing a whole new dock to accommodate it, which made it a poor cross-generational investment. And even the one thing the previous generation docks were designed for, they weren’t very good at, as they each only had one external monitor output, which made the use of multiple external monitors difficult. The new Surface Dock completely eliminates all those problems. 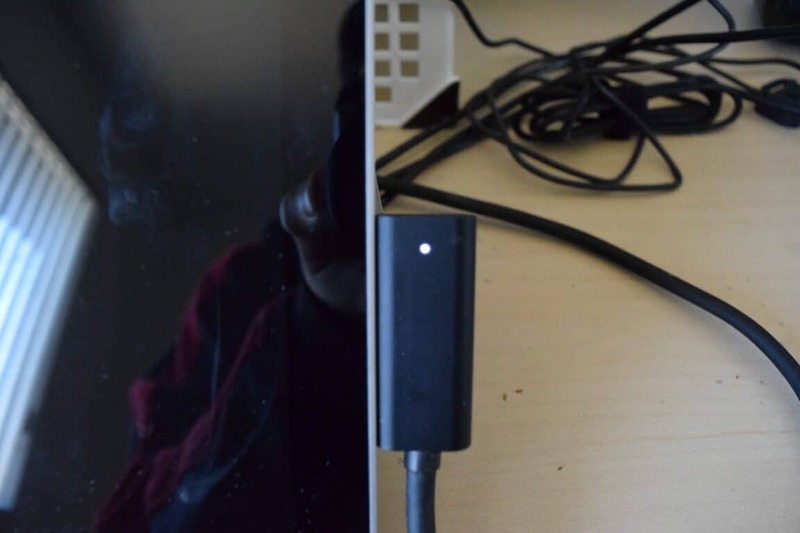 It’s new form factor, which renders it more like a hub than an actual dock, connects to Surface device’s through a simple and thin SurfaceConnect cable. It’s backwards compatible with the Surface Pro 3, as well as cross-compatible with the new Surface Pro 4 and the new Surface Book. It will almost most certainly be compatible with future generations of flagship Surface products, making it a sound investment for avid Surface buyers. The “dockless” design also means users can use the Surface normally, kickstand and all. And its new hub form factor is tiny, allowing it to take up very little desk space. I have my dock planted on the stand beneath my monitor’s screen, causing it to take virtually no space at all. And it can finally support two external monitors directly via its two mini-DisplayPorts. The new Surface Dock comes in two pieces: the dock itself, and a power brick. The dock itself is quite heavy. This however makes perfect sense as it prevents the dock from being dragged around when rearranging connected wires. It also makes the dock feel more premium and substantial than it otherwise would. As I mentioned in my unboxing preview, one rather annoying ergonomic design is how short the wire from the power brick to the outlet is. 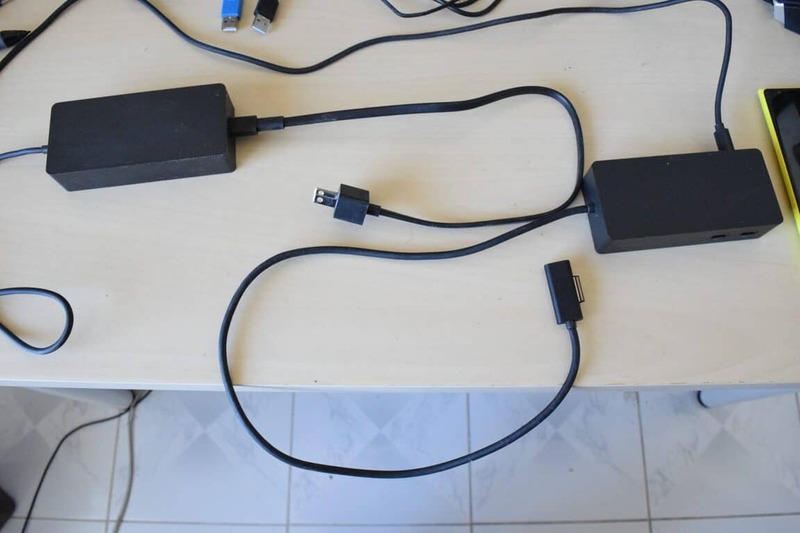 This makes positioning the power brick through certain desks rather cumbersome, as the power brick has a hard time fitting in tight spaces and is often dangling uncomfortably from being hung by the outlet connection. Speaking of wire lengths, the SurfaceConnect plug from the dock to the device is too short. This can be a big issue for larger desks that require the dock to be placed far away from the user’s seat. While you could certainly argue that such a dynamic doesn’t matter because people buy the dock to use their Surface as a desktop, I contend that this is potentially a big problem. One of the most useful facets of the new dock is that it allows you to use your Surface as you would normally, kickstand and all. This is great for artists who rely on the kickstand to find the perfect drawing posture. It also allows the Surface’s display to be positioned easily for use as a second or third primary monitor, or a source for multi-touch interaction, such as easily zooming in on OneNote notes. The short cable threatens to mitigate these use cases. One finer detail I appreciate is the softness of the light emitted from the SurfaceConnect plug to indicate that it’s plugged in and charging. When my non-Pro Surface 3, for example, is plugged in, it emits a bright light that makes its presence very known in my bedroom at night, which makes sleeping while charging somewhat unpleasant. The same applies to many electronics that recharge. Thankfully, the dock’s charging light when plugged into my Surface Pro 4 at night is a very soft and small dot, completely unobtrusive in the darkness. Another pleasant use of the dock is that it acts an always-on charging station for USB based devices. Even when my Surface Pro 4 is disconnected, the charging is still available on the dock, and have used it regularly to charge my Lumia 1520 and Microsoft Band 2. One disappointing omission from the new dock is the lack of reversible USB Type-C ports. However, given that most USB Type-C connected devices that would connect to the dock would probably do so through a USB Type-C to standard USB connector the omission is somewhat understandable. But still disappointing, and in a $200 USD stationary device feels like cost-cutting. Furthermore, the dock needs more USB ports. Four sounds like a lot on paper, but in reality it isn’t enough. I have a mouse, microphone, and my phone all attached through USB ports. That takes up three. If I attached my mechanical keyboard (which I didn’t do because I needed to get to know the new Type Cover), there would be none left. And I still haven’t plugged in a better webcam, external hard drive, Yiynova drawing tablet, and many other useful peripherals. A typical desktop tower would have at least 6, and I think that would be perfect for this dock. 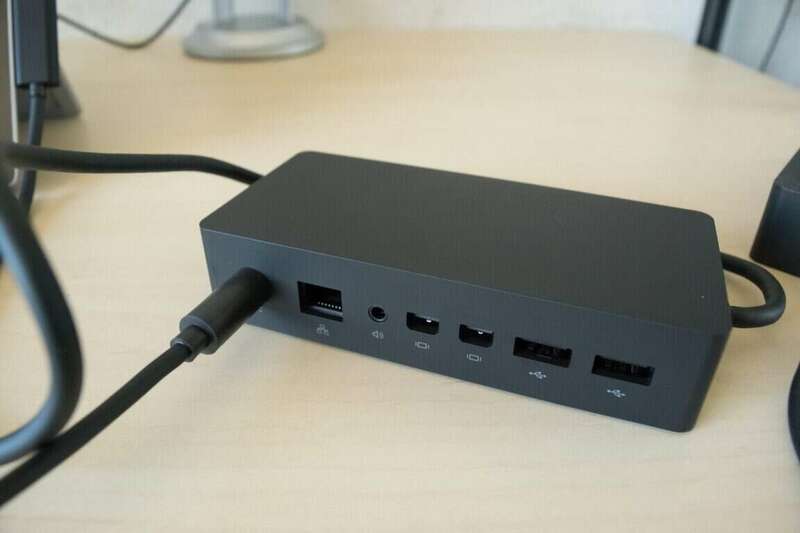 It’s not like the Surface Dock doesn’t have sufficient power either, as the power brick has a 90W capacity, more than enough to support any and all flagship surface devices with plenty to spare. Speaking of capacity, as I’ve discussed in my Surface Pro 4 battery charging times, don’t expect the dock to charge your Surface devices any quicker despite the larger capacity. Another thing I would’ve liked to see in the dock is an SD card slot. It would make fiddling with my Nikon D3300’s memory bank a bit more pleasant, and make my Surface feel more desktop-like. All told, the new Surface Dock is the best iteration of the Surface Dock thus far, easily surpassing its predecessors. The new hub design is great, and makes the dock much more versatile. I’ve listed a lot of complaints above, but that’s more because I wouldn’t have much to write about otherwise. The good points of the dock are really obvious and easily overwhelm the bad points. And for the first time, it’s actually a sound investment for avid users who swap Surfaces often. And at $200 USD, it better be. Head over here to buy the Surface Dock. How do you like the new Surface Dock over the older versions?